Utagawa Kuniyoshi (1797-1861) Personal encounters for the eight views: Returning Sails at Yabase, 1848. Oban. Kuniyoshi is perhaps the best known Ukiyo-e artist aside from Hiroshige. His work is highly collectible and he was the subject of a major show at the Royal Academy in London in 2009. This print is from a series of eight traditional views of the wetlands of Dongting in China in the eleventh century. In this series, the same eight views - autumn moon, lingering snow, evening glow, vesper bells, returning boats, clearing weather, night rain and homing geese - are likened to scenes from kabuki plays. 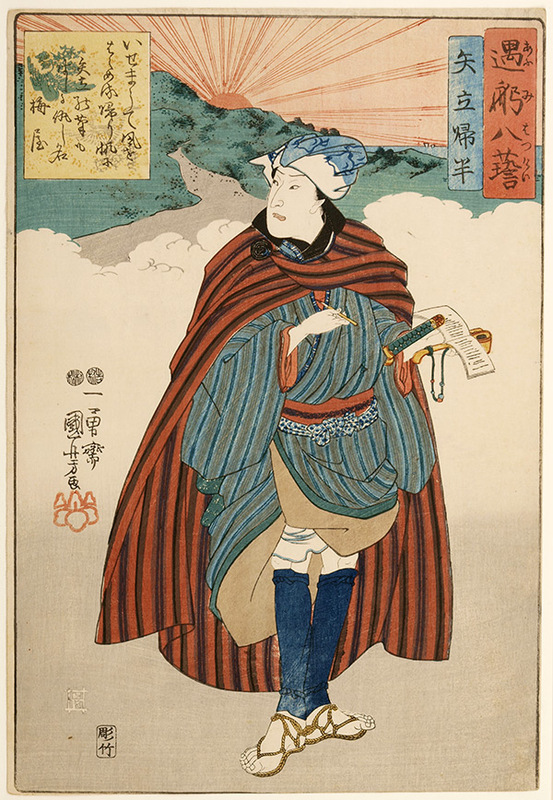 This print depicts Sawamuro V as Yadate Kihan jotting in his notebook before an evening landscape. The actor/poet is caught pensively searching for words, holding a travelling writing set in his left hand and a brush in his right. An elegant and understated Kuniyoshi in superb condition. Untrimmed and a fine edition having shading (gauffrage) applied to the foreground, a technique reserved for prints of high quality. Signed Ichiyusai Kuniyoshi ga. Kiri Seal. Published by Arita-ya Seiemon.